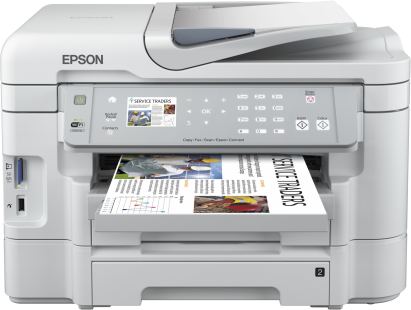 A true office workhorse, the Epson Workforce WF-3530DTWF is a WiFi ready, duplex printer, scanner, copier, and fax machine that features a wide range of office-functions for small to mid-size offices. It uses XL inks, which ensure better productivity and lower print costs, making the Epson Workforce WF-3530DTWF Wi-Fi 4-in1 with ADF an excellent choice for busy print environments. The Workforce WF3530 DTWF colour inkjet works from a wide range of sources, and it has Ethernet configuration, which makes it easier to share between multiple users. However, its print speeds are not as impressive as competing devices, averaging only 15 pages per minute. The Epson Workforce WF-3530DTWF is a compact all-in-one device suitable for desktop use. It has dual 250-sheet media trays, for a 500-sheet total media capacity, along with a single-sheet rear feed tray that allows extra media flexibility. The device even has a duplex ADF unit for convenient scanning, copying, and faxing of multi-page documents. The Epson Workforce WF-3530DTWF all-in-one inkjet printer offers flexible connectivity, featuring WiFi and Ethernet support, which is ideal for shared printer environments. One of the best advantages of the Epson Workforce WF-3530DTWF inkjet printer is its connective flexibility. Not only is the device WiFi and network ready, it also supports direct printing from various devices. The Epson WF3530DTWF multifunction printer features a 6.3cm display with an intuitive control panel, which makes it easy to navigate functions and menus. It has a built-in memory card reader and can be used with the Epson Connect program, which gives users the freedom to scan and print anywhere. For best value printing, extra high capacity Epson Workforce WF-3530DTWF ink cartridges are available to ensure a low cost-per-page. The Workforce WF-3530DTWF printer, however, fails to offer fast output rates, capable only of printing up to 15 pages per minute for single sided documents.